As I sat in my stand, I kept replaying the shot over and over again in my mind. I didn't see the deer go down in sight and there was no tell-tale crash within ear shot. Did I make a good shot? Was I in for a nice short blood trail, or would I be up into the early morning hours, crawling on my hands and knees in search for the deer I had just sent an arrow towards? I thought I saw the arrow bury behind his front shoulder but as usual, I sat there second guessing myself. Earlier in the year, I had been getting a few nice two year olds on my trail cameras but no mature bucks ever showed up. It has been three years since I last killed a buck, so to say I was let down would be an understatement. My personal goal is to hold out for bucks that are at three and half years old, so I am used to going a season or two without filling a buck tag. 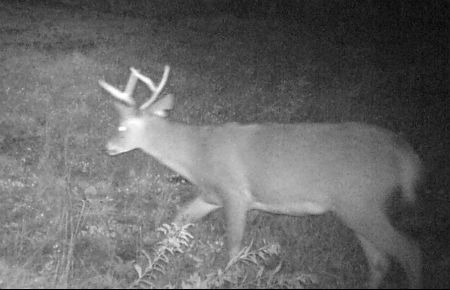 It wasn't until October 11th that I had my first trail cam photo of a buck that got my attention. It was a tough call, this deer had characteristics of both a two and half year old and a three and half year old. Regardless of his age, he was a very unique buck and carried possibly one of the largest four point racks that I will ever see. After looking at the picture for a considerable amount of time, I told myself that I would need to see this deer in person to get a better idea. I had already filled one antlerless tag and put meat in the freezer so now, my strategy shifted to hunting this buck. The lone trail cam photo that I had of this deer was at the southern end of my one hundred and fifty acre property at one in the morning. I have been hunting this property for over a decade so I had a pretty good understanding of how the deer behaved on it. That week, after scouring weather and wind charts, I decided that when the weekend rolled around, I would be setting up in a stand at the northern end of my property. Three days before I would be hunting again, I hung a new stand in a spot that has long been considered the "Honey Hole" on this property. In 2012 I took a beautiful four year old eight point that tipped the scales at over two hundred pounds dressed, in this same area. I set the stand in a young pine tree that was located on the edge of both a swale grass swamp and a small thicket with a lone apple tree that was dropping plenty of apples. To my north was a line of very large, very old oak trees that were dropping acorns nearly non-stop. To my east was the thicket that separated the swale grass swamp from a very large beaver swamp and to my west was a steep hill that consisted mostly of pines trees. This stand would put me within 15 yards of two main runs that led out of the thicket and oaks as the deer crossed the swale grass swamp to head out to the food sources. That work week could not have gone by any slower but finally the weekend came and I was ready. Due to the proximity of this stand to some major bedding areas I made sure that I got into the stand early in the afternoon. The wind was perfect, blowing at 5-10MPH out of the Southeast. It was just one of those text book setups; food and thick cover in close proximity to major bedding areas with a perfect wind. I knew that if a mature buck was in here, I would most likely get to see him with plenty of shooting light left to spare. The first few hours of my hunt were uneventful, although the time spent in the stand that day was something that I needed desperately. I took that time to take in all of the wonder that nature had to offer me that day. The squirrels were the opening act in a show where I was the only audience member. I sat and listened to them fight over the seemingly infinite number of acorns that were bouncing off the forest floor. Somewhere off to my south, a beaver slapped its tail in the area of the swamp that it called home and the chick-a-dees had made their appearance as one landed only feet away on a small pine branch. It was a great reminder that no matter what is going on in my life, I can always be sure that my time spent out here is worth every effort. It wasn't long before I realized that I had lost track of time. I was down to the last hour and it was time to start really paying attention. The wind had lost some speed and the squirrel activity had slowed enough for me to hear the tell tale sound of a deer making its way through the swamp to my east. As hard as I searched I just could not see the deer responsible for making all the noise. Fifteen minutes passed and I no longer heard anything. My guess at the time was that the deer made its way to the opposite side of the swamp. It wasn't two seconds later that the final chapters of this story would begin to reveal themselves. My head snapped around as I heard a stick crack, this time it was much closer. As close as the sound was, I still couldn't see anything but I knew that a deer of some kind was close. Suddenly, the top of a small ten foot tree about 60 yards away started swaying violently, back and forth. That was all I needed to see to know that the deer I had heard was a buck. I pulled up my binoculars and strained to see the deer through the thick brush and tall swamp grasses. It was then that I noticed just the antlers of the four point I had been staring at on my trail cam pictures all week, going up and down on this tree as he made a rub. He was wide, with white antlers that hadn't had time to darken up from a season of scraping the bark off different species of saplings. I still wasn't convinced that this was a mature deer, so the bow continued to hang as I watched him intently through my binoculars. It wasn't long before the tree stopped swaying back and forth. As I watched this deer step into an small opening, my heart began to race. 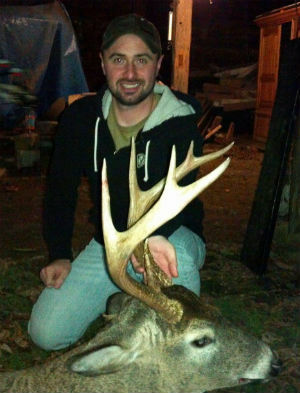 He was huge, his body size rivaled that of other mature bucks I had taken in the past. His neck was already swollen and both of his ears were torn multiple times from fighting. That was enough to convince me that I was going to take a shot at this deer if he presented the opportunity. He was on a trail that would take him under the apple tree, and into the swail grass for an easy fifteen yard shot. I grabbed my bow and positioned myself for that shot when the time came. The deer continued at a slow but steady pace. Soon, he was under the apple tree and began eating some of the apples I had watched fall to the ground earlier, only twenty yards away. It was right then, at that very moment that one of the worst possible scenarios began to unfold. The wind, which had been blowing steadily out of the Southeast all day had all but come to a stand still and now the thermals coming down off the pine hill behind me began to win the battle as they hit the back of my neck. I am a self-proclaimed freak about scent control and often times I question whether or not it is really worth it, but today that question was answered. After a couple of minutes, the sound of apples being eaten by the buck had stopped and I did not see any movement. It was still very thick and visibility was low, even at twenty yards. I desperately scanned the area for any sign of movement as I feared that this buck had caught my scent. Then I saw movement under the apple tree as the buck lifted his nose in the air, trying to catch more of the strange scent that was blowing his way. Even though the wind was directly at my back blowing right at this buck, the scent he was catching wasn't enough to make him run for cover in a blaze of broken branches and fur. My scent control fanaticism was paying off. The buck wasn't stupid either, and I could tell he was uncomfortable as he turned around and took a few step back towards the direction that he had come from. I knew if I was going to get a shot at this deer, I would have to find an opening. I searched between the thick pine branches and brush that he was concealed in and found a hole no bigger than a bowling ball that was still a few feet in front of the buck. In order to make the shot, I would need to kneel down on the platform of the stand and rest on the heels of my boots all while stopping the deer at just the right time so that his vitals lined up with the very small opening that I had to shoot through. Not seconds later, he did just that. I mouth called to stop the buck and drew my bow in one of the most uncomfortable positions I have ever shot from. As the adrenaline rushed through my body, I was surprisingly steady as the top pin of my sight came to rest behind his shoulder. I focused my thoughts on my release and watched as the arrow flew true and sunk behind his front shoulder. The buck jumped and ran tail down, crashing through the brush and up towards the oak tree flat to my north. I watched and listened, trying to see or hear the buck as he went down but I was not rewarded by either. I sat back in my stand and that is when the rush really hit me. 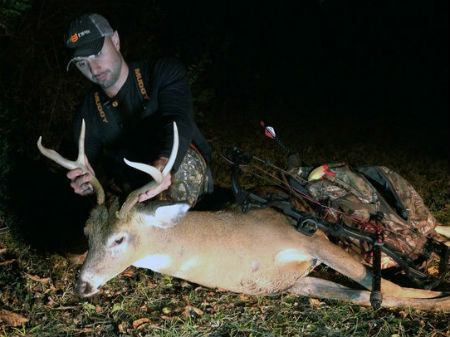 When I go multiple seasons and countless hours without killing a mature buck, the feeling I get from finally making contact with one is something that I simply can't put into this story. After a good twenty minutes or so, I had finally calmed down enough to safely climb down from my stand. I wanted to give the deer plenty of time, but I also wanted to check the point of impact for any sign on the type of shot I had made. I knew what I saw when I shot the deer, but when your mind is in that state it can play tricks on you so I wanted to be sure. My heart sank when I made my way to the area where he was standing when I made that shot. There was no blood or hair, but there was also no arrow. I made my way another twenty yards up the trail before I finally found a small speck of blood, high up on the brush in front of me. Now my worries had become even greater as I imagined the arrow hitting high or in a different spot than I had imagined. I decided to back out and head to the house to get my father and flashlights. After forty five minutes or so, I was back. I went to where I last saw blood and continued up the trail. The blood did not look good with only small specks showing up every ten feet or so. I followed this pattern of blood for another fifty yards before I finally saw something that got my heart racing again. There was a white birch tree roughly four feet off to the left of the trail that this buck was running down and on it was multiple specs of blood. This told me that the deer was not just bleeding, he was spraying blood and to me this meant I had either hit his lungs or a major artery. Shortly after that I found the arrow and the blood started to really show up at this point, bright red and loaded with tiny bubbles. I now knew that this deer was fatally hit and as that thought went through my mind, I looked up to see a white belly lying in the woods only a short way ahead of me. As I do with any deer I shoot, I sat there for a moment admiring and respecting the life that I had just taken. He was a unique and beautiful buck and his body was huge. As I looked away from the largest four point rack I ever held in my hands, I noticed he had a double throat patch and a large light red forehead that stood out against his brown and grey fall coat. The buck would eventually be weighed at one hundred and seventy eight pounds after field dressing and will go down as one of my most memorable hunts of all time."